Puppies need to be fed every few hours and need access to a constant supply of water. Stainless steel bowls are the best bet – they’re easy to clean and can’t be chewed. Get two bowls – one for food and one for water. When you get your pup, ask the care-taker/breeder what food she is used to eating and purchase or cook the same at home. It is not advisable to change the diet or timings abruptly as it can cause a tummy upset. If you do want to change the diet, do it gradually, over a period of weeks. Puppies, like babies, need to sleep every few hours to recharge their batteries. Purchase a soft bed for your pup or a few old blankets or quilt will do just as well. If you do purchase a bed, make sure it is easy to clean or has covers that can be tossed into a washing machine. Avoid fancy beds with intricate designs or cushions made of silk and velvet. Not only are they cumbersome to keep clean, but often the artificial fabric causes your pup to itch. Well before you bring your pup home ask around for a good vet in your area. You will need him or her to help you with inoculations, de-worming, diet, health, handling tips and much more throughout your puppy’s life. Visit your vet beforehand and check if the clinic is clean and the people friendly. Though most vets are hard pressed for time, your chosen one should care about your pet and take a few extra minutes to help you with any problems you have. 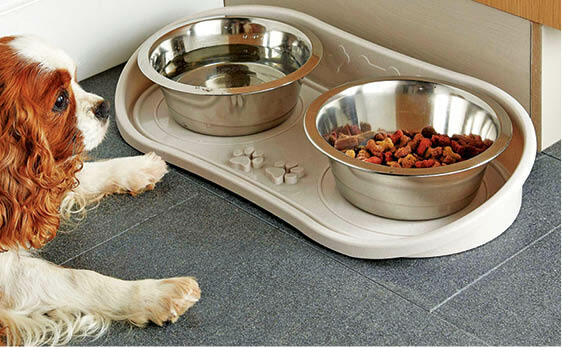 Most will deliver dog food to your home, medicine, grooming aids and canine accessories. This is useful when you run out of food, or you are time pressed to pop down to the shop. Keep such shop numbers handy and find out the working hours. You’ll thank your self for it in the future. 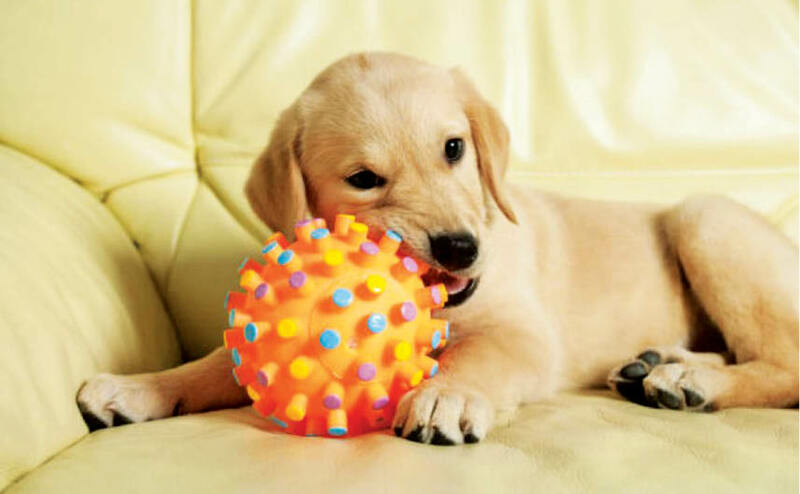 All puppies love to chew, so purchase a few safe chew toys and chewies that will keep her inquisitive mouth away from your furniture or plants and will keep her from getting bored. Try and purchase toys made of different textures, for eg – a toy made of rubber, one made of cloth and maybe one made of hard plastic. Providing a variety will minimise your pup chewing up household items. Make sure the toys are of good quality and have no parts that can come loose (like squeaks) or break apart as these can pose a choking hazard to your pup. Puppies love to explore and chew on anything they can get their little teeth into. Before your pup comes home, you need to pick up any small dangerous objects lying around, tuck away hanging electrical wires, secure your dustbins with fitting lids and put away any household cleaners and glassware to prevent your pup from getting to them. Also make sure that hanging cords on curtains and draperies are safely secured out of your pup’s reach as a playful pup can get entangled and ‘hang’ if the cord gets wrapped around its neck. If you do not want your pup to chew up your carpet, books or any items on the coffee table, it is best to remove all of them till your pup is older and has passed this naughty phase. It is imperative that you get your pup used to being groomed very early on. Puppies that are not handled sufficiently when young are known to resent being groomed and handled later in life. A soft brush or comb is all you need for a young pup. The pet market is awash with shampoos and conditioners in all sorts of all colours and scents. Purchase a simple puppy shampoo that promises to be gentle on your pet’s skin. Puppies should not be bathed very often, and your vet will advise you when to start; when you do bathe her, make sure it is a pleasant experience. Even though you may not need to put on the collar and leash on the first day, it is advisable to get your pup used to being on a soft, adjustable collar at an early age. You may also want to purchase an ID tag which carries your dog’s name, your name and contact details. This will help if ever your pup runs off or is lost. If you won’t be around much to keep your pup safe and out of trouble or if you have a busy household and you want your pup out of the way from time to time, you may want to purchase a crate for your puppy. Buy one that is of good quality with no sharp corners or rough edges and one that is slightly large so that your pup can grow into it. Your dog should be able to stand and turn in the crate comfortably. Place a blanket inside with a few of her chew toys and encourage her to nap inside whenever possible. Don’t force her to be there against her wishes or send her to her crate as a punishment. She should view it as a safe den to turn to when tired or stressed. If you have young children at home, do not allow them to treat the pup as another toy. Explain to them that a puppy is a living being and must be treated gently. Children should not be allowed to pull a pup’s ears or tail, pick it up and carry it around or otherwise treat it carelessly. Young children must be supervised by an adult when around any dog. Do keep in mind through all the excitement that your puppy is going through a whole lot of new experiences on the first day. So many new smells, sights and people and she is away from her mum for the first time. All of this can be overwhelming and she will need frequent nap breaks to rejuvenate. Allow her to nap whenever she desires and make sure she is undisturbed throughout. Get your pup into a routine from the first day – it will help her settle into her new home with ease. Make sure you feed her at fixed times (this will also help with your toilet training) and preferably have fixed times where you groom her and play with her. It is important that you choose a spot where you want your pup to toilet. As soon as she comes home, encourage her to toilet in that particular area. Start the habit early or you will have to deal with cleaning up messes all over the house. A puppy put on a consistent toilet training programme will get housetrained within a week. Till your pup is toileting outside you will need a large stock of newspapers for your pup to toilet on or to clean up any messes, so stock up on those well in advance.